17th Annual CMHA Holiday Concert at Tuckerman Hall (December 2006) - photo by Sherwood Photo. When you want an experienced, professional, affordable, authentic 20-piece big band, check out the internationally acclaimed Compaq Big Band. 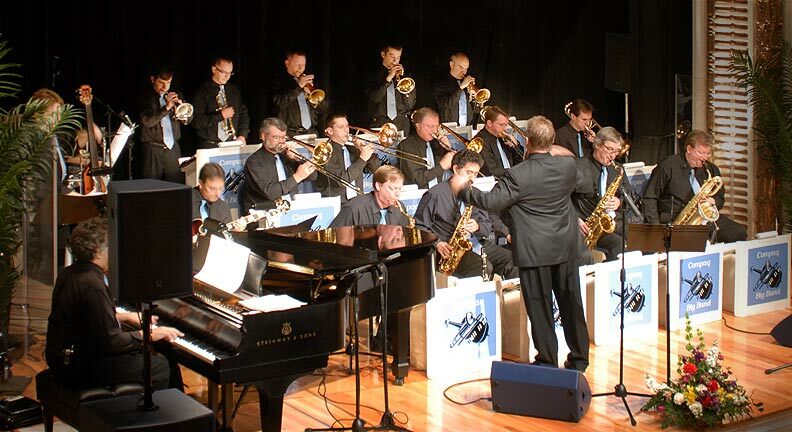 They've kept New England swingin' since 1975, with a big band repertoire that begins with honoring the classics from the 30s and 40s as performed by the bands of Glenn Miller, Artie Shaw, Tommy Dorsey, Count Basie, Duke Ellington, and other greats. We balance instrumental charts and horn features with vocal numbers such as those popularized by Frank Sinatra, Ella Fitzgerald, Billie Holiday, Bobby Darin, Frankie Randall, Nancy Wilson, Diane Schuur, and many more. Next gig - Swing City - Saturday, April 27 - Cambridge, MA. Read what people are saying about the Compaq Big Band.